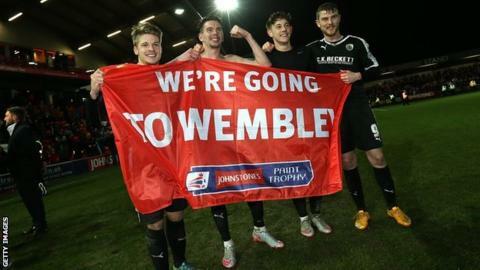 Barnsley edged Fleetwood Town in a penalty shootout to book a Johnstone's Paint Trophy final date with Oxford at Wembley in April. After the tie finished 2-2 on aggregate, Adam Hammill's spot-kick won the shootout 4-2, to book a first trip to the national stadium since 2008. Conor Hourihane had put Barnsley ahead, slipping in from Sam Winnall's pass from the edge of the box. Ashley Hunter equalised after smart footwork to send the game to penalties. Fleetwood's Chris Maxwell saved from Josh Scowen, but Barnsley's Adam Davies followed suit for the visitors to deny home defender Conor McLaughlin. Winnall's successful kick gave Barnsley the lead and once Amari'i Bell's penalty was kept out, Hammill netted to confirm the win. League Two side Oxford knocked out Millwall over two legs to secure their place in the final on 3 April.